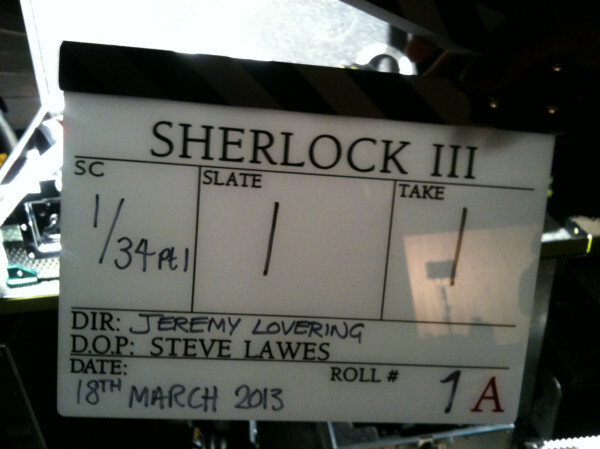 Sherlock Series 3: First Episode Title Revealed! As previously mentioned, after what feels like a waiting period of basically my entire life, filming has officially begun on the highly anticipated third series of Sherlock. And now, straight from the horse’s mouth – or rather, from its computer, thanks to the Twitter account of co-creator Mark Gatiss – we know the official name of the first episode of the new season. Gatiss has confirmed that Series 3 will kick off with an episode called The Empty Hearse. This title continues the show’s tradition of referencing classic Sir Arthur Conan Doyle stories from the Sherlock Holmes canon in (most of) its episode names, and is clearly a play on The Adventure of the Empty House, the story in which Sherlock Holmes suddenly reveals to John Watson that he is, in fact, not so dead after all. Since we sort of all expected some variation of The Empty House as the leadoff for the new season anyway, the actual best part of this news is that by directly identifying that story as the basis for this episode adaptation (at least in some part), it’s made it all okay for us to speculate that we’re finally going to meet Sebastian Moran, Moriarty’s (former) right hand man. Of course, nothing has been officially confirmed about that, but The Empty House is our first introduction to Moran in canon, and it’s a natural storyline progression that would make sense for the show. Something (or someone) has to be keeping Sherlock away for however long he’s gone, after all, and we do need a Moriarty replacement of some sort. A quick skim of Tumblr tells me that a lot of Sherlock fandom has already assumed that the sniper aiming at John in The Reichenbach Fall was actually Moran, but that’s never been confirmed, even though it would be a rather lovely bit of symmetry if it were true. (Moran is a crack shot in the canon, so it wouldn’t be a stretch.) However, if we are going to see Moran this year, the show is certainly keeping casting news well under wraps, as other than Twitter confirming for us that there is in fact a new actor on the show named Tomi May, we have no idea who he’s playing. They went months without telling us who was playing Irene Adler, after all, so this isn’t exactly unprecedented, but still. Inquiring minds want to know. The "Call the Midwife" team has shared a glimpse behind the scenes of Season 8 filming!